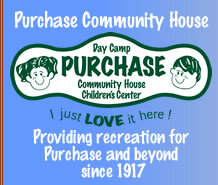 This is the website of Purchase Community, Inc.
We can be reached via e-mail at office@purchasehouse.com or you can reach us by telephone at (914) 949-2636. The Purchase Community, Inc. values your interaction with our web site. We are committed to protecting your privacy as you use the site, make donations and or program payments. No personal information is gathered about you unless you knowingly and willingly provide it. Any personal information you share with us will be protected. Your information will never be sold or shared with other individuals or organizations. Our site uses Internet cookies to enhance your web experience and track your shopping cart. This information does not identify you personally. Any financial information provided to make donations or make program payments is safeguarded by secure computer encryption and rigorously protected. If you sign up for our e-mail newsletter, you can unsubscribe from the list at any time, either through an opt out option on the email itself, or by sending an email to office@purchasehouse.com asking to unsubscribe. Any requests for refunds of online donations and payments are handled in the main office. Please feel free to email us at office@purchasehouse.com or call us at (914) 949-2636 with any questions.